Kenny and “Chopper” were two brothers. They were adopted and frequented the church I came to faith in JESUS as a child. They were African American and I was born into a middle class white family. Together we were “ebony and ivory.” We were brothers in Christ and I looked up to them in more ways than one. First, they had HEIGHT! No joke they were both a foot taller than me and it was a highlight for me as a child to go over to their humble house on occasion after church. They were good, decent, respectful and kind brothers from another mother. They didn’t have much finances but they were definitely rich in faith. Almost four decades removed I can still picture them singing at the top of their lungs the hymns we sang in church. Truly the ground is level at the foot of the cross. Chopper was the older of the two siblings and his favorite song was his anthem in life. I can still see him singing the hymn “Yield NOT to temptation.” Initially, I first looked up to him for his height but even then I really admired him because he got a hold of Heaven when he prayed and praised. The brothers were borderline poor but among the wealthiest when they sang of their risen Savior. Those brothers knew God and God knew them! It is imperative that we YIELD away from sin but also our self. The Apostle Paul said, “I Die Daily.” Ironically, that was probably President Ronald Reagan’s favorite verse because he had to dye almost daily to be eighty years old with NO grey hairs! Seriously, the man in the mirror is often our worse enemy. When on a diet it seems as if the first three letters spell what we are feeling. When we abstain from snacks and soda on a diet it does feel as if we are going to DIE. However we are never more alive when dying to the deadly habits and toxins that rob our joy, harm our body and slow us down. Henry Ford was right when he said, “If you think you can or can’t you are right!” Jesus said, “A double minded man is unstable in all their ways.” Some of us need a check up from the neck up and we need to toss out STINKING THINKING! The Bible is clear that we find pleasure in sin for a season but we need to graduate past the temporal and take the long look at the eternal. NFL stands for ‘Not For Long’ and yes to play a season is good but a career with God is greater. We do well to yield not to sin or self but the game changer below makes all the difference. We need to YIELD to the Spirit. More specifically the Holy Spirit and tap into the Triune God. In the month of September 2015, I was blessed to minister in five states (not counting radio or television) and had a front row seat to watch the Holy Sprit convict sin and draw souls to Himself. Praise God I saw Jesus save 173 souls in September! So thankful for my good friend, Pastor Tim at Rolling Hills Baptist and I love his heart for souls and the saints. Together, we watched God saved SEVENTY NINE in one day in North Carolina while in town preaching revival. While in Wilmington (hometown of Michael Jordan & Meadowlark Lemon) I preached NINE forty minute sermons and after the conclusion we saw God save 95 souls in three days. Preaching nine times in 72 hours can make anyone feel like a muffler – EXHAUSTED! No joke – I was physically and emotionally drained. With no exaggeration or embellishment I related it to a NASCAR driver hitting a wall at 200 mph and the car may stop on a dime after hitting the concrete wall but the body and brain are still moving nonstop. To make matters even more exhausting when going to bed after preaching it is almost impossible. It is not always easy as one might think when you are that tired. The accommodations have been amazing but as a rule on the road they are not always so nice. For starters, hotels (regardless how nice) are not comfortable. Hotel pillows are never like home and the adrenaline from preaching non stop has one whom have never done illegal drugs make you get an idea what “high” really means. Plus the anointing that was all over you in the pulpit is not vaporizing by the minute. It never helps when it takes several hours to go to sleep and add into the mix with a four am wake up call because your ride is in the hotel lobby at 4:30AM for a 6AM flight! Sleeping with an eye on the alarm clock and other closed makes “resting” a word that escapes this evangelist dictionary. The moment I landed home into the city of my birth (Washington, DC) and grabbed my bags at Ronald Reagan National Airport I smiled because my father not only protected him but I heard him speak in person as a ten year old kid. Some see monuments but I have been blessed to know men and Reagan was patriotism personified and a man of deep prayer. One of my favorite pictures is my dear friend Meadowlark Lemon praying with his massive Hall of Fame basketball hands on the Commander in Chief’s shoulder in the Oval Office in early 1980’s. With my carry on suitcase in one hand I am now making a call with the other on the largest Christian radio station in Dover, DE promoting the “My Hope with Billy Graham” new outreach for November 7, 2015 with staff and station manager for a promotional blitz. Completely exhausted and running on fumes immediately I have to walk into my house upbeat to assist with my duties as a husband and father as my wife helped keep the trains on track on the last trip. Marriage and ministry are certainly a TEAM effort. In ten days I had preached FIFTEEN times and at age 43, my body doesn’t recover as quick. How Michael Jordan ran the hardwood at 39 and 40 in NBA was a minor miracle but even time had a way to ground “Air Jordan.” After a day and half home that went by way too fast I was out the door to preach revival meetings again in Colonial Beach, Virginia. They are a BOOMING church and doing an amazing job in that region and last year we saw God saved 44 during the revival. Pastor Randall is an amazing man of God and I love his team more than life itself! The week before as I flew into North Carolina I was trusting God for 100 souls saved. I recall the legendary true story of the Sultan of Swat Babe Ruth in a baseball game in the batter’s box and pointed to the fence indicating he was not only going to hit a homerun but telling the pitcher and everyone in that stadium the vicinity he would hit it. The very next pitch he proceeded to smash that ball within feet of the spot he pointed! Call it a Holy Hunch I was sensing God was going to do that in North Carolina and without a doubt the Lord blessed in a powerful way. Immediately, I began to walk towards the platform and in full disclosure Satan was for the first time I could recall in a long time begging and even tempting me to preach. Dr. Billy Graham said if he could do one thing different in ministry would have been to preach less and PRAY more. What seemed like an eternity but in a matter of seconds I had a dilemma. On rare occasions I still wear cufflinks and this was another time I was going with God “off the cuff.” I had a quick decision I could do it my way or God’s way. I could be in the FLESH or honor God by FAITH. I knew the church was expecting me and hate to say this but “paying me” to preach their sermon for the revival meetings and I knew something was off when Satan was tempting me to preach opposed to YIELD to the SPIRIT. In nanoseconds I was thinking we just saw nearly a hundred saved the week before, I wanted to preach, give them a joke and then JESUS but I knew two things then and there. First, obedience is better than sacrifice and second the worse feeling in the world is preaching in a pulpit and knowing you are the only one up there. READ THAT AGAIN! If God is not on it I don’t want any part of it plus the pillows are bad enough to sleep in a hotel but it is a hundred times worse when you tried to do ministry apart for God. All these years later I can still hear Kenny and Chopper singing at the country church I came to Christ in 1979, “Yield Not to Temptation for yielding is sin; Each victory will help you some other to win. He who is our Savior, our strength renew, Look ever to Jesus, He’ll carry you through.” Yes we must not yield to Sin and Self but we must YIELD to the Spirit if we are going to partner with God and see Him accomplish what only He can do. The next time you are asked to pray don’t preach and when God says stop don’t start! The first is by faith anything else is flesh. 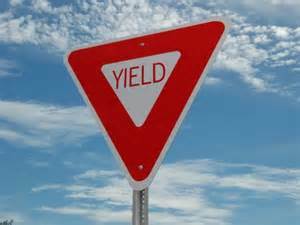 You can yield to the Spirit and continue safely with God or try it your way and realize it is dangerous on your own. The Spirit is willing but too often the flesh is weak. God help us all to Yield to the Holy Spirit.